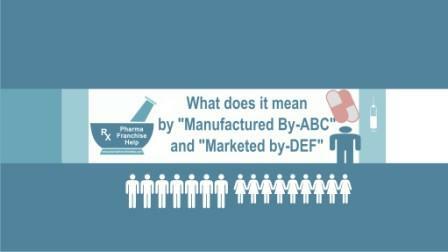 What does it mean by "Manufactured By-ABC" and "Marketed by-DEF"? Thank you very much for such a good explanation at your blog. One quick question comes in my mind. I know many traders who only market but not manufacturer. They have cartons written “Manufactured By-ABC” and “Marketed by-DEF”. Still they are making good profit and offering monopoly rights. Can you elaborate what is their mode of operations. Second thing, how I come to know the rates offered by my competitors. If a packaging contains these words that means it is manufactured by any another company but marketed by any other company. Medicines can’t be manufactured by any drug manufacturing license and there is compulsion for writing name of manufacturing company at medicine box. If we don’t have any manufacturing license but want to sell medicines by our own name then we can establish a pharmaceutical marketing company and start to get manufactured products from any pharmaceutical manufacturing unit. Then brand names and ownership of products will be ours i.e. of marketing company. The same in case you mentioned in your query. The companies you are talking about is Marketing Based Companies. They get manufactured their products at third party basis and market their products throughout India or particular area. Some of these type of companies also do exports in many countries. If I say real thing, these companies make more profit as compare to manufacturing companies. Pharma manufacturing companies have high expenses but marketing companies have negligible expenses. Margin line is near about same in both cases, but expenses make the difference. Less staff requirement, low monthly expenses are key for them. Few companies you will find, that are operating from a single room. Most of “Marketed by” companies do work as Branded/Ethical promotion or/and at franchise/PCD basis or/and generic basic. All PCD/Franchise companies provide monopoly rights for particular area, district or whole state, depend upon parties sale. They have wholesale drug distribution licence and GSTN for sale tax purposes. If you have the same, you can also get manufactured products to your firm name. We recommend most of person to start as a marketing base companies in starting. When sale start to rise and you feel, you need to enter in manufacturing for better supply, you can start your manufacturing unit. You can’t know about competitor rates unless you enter into market or go to the distributor. In monopoly rights marketing or PCD marketing rate makes the difference but not at all. Other factors like your product range, service, your company name, brand names, trade mark registration of products, trade mark registration of company, party size, party sale, area of coverage etc are the things that are much of interest.Rates are key player only in generic market. In Branded/ethical Marketing, MRP matters. Regarding rates, you can start with particular margin at your cost. When you will approach to party, party will give you exact idea of your competitor rates. But don’t go below your least margin level because it can cause big damage to your company. Always work with good margin so all your company expenses and your living go smoothly. How to Start Carrying and Forwarding agent business in Pharmaceutical Sector? How many Chemist Shop could be opened with a Pharmacist Registration? How to register as a Pharmacist? What is the procedure for packing material Procurement, Inventory, type in Pharmaceutical/Ayurvedic Manufacturing Company?